March into April is the best time of the year to pull a giant bass out of a northern reservoir. Warming water spurs the egg-laden females out of the depths and into prespawn staging areas near shoreline shallows where hordes of baitfish also seek warmer water. Moreover, the shad are susceptible to early spring temperature swings, which may leave them in a half-stunned state. Anglers should take note anytime fish in predictable locations are gulping down easy food, and when an unusually high proportion of the biggest bass in the lake are on a feeding spree, trophy bass anglers should take special note. “I realistically expect to catch a five-pound-plus bass every time out, hopefully a few,” said George Boggio, a solid competitor in local Pennsylvania bass tourneys. While a five-pounder may not raise eyebrows down South, it serves as the unofficial big-bass benchmark here in the upper latitudes. Boggio’s best early spring outing was seven bass ranging from 5 to 7-plus pounds, an incredible day just about anywhere let alone north of the Mason-Dixon line. How early does this bite start? “Last spring, I was casting around shoreline crust and skating my lure from the top of ice sheets,” Boggio said. “And I popped a good five-pounder. When I fished with Boggio on a small Pennsylvania reservoir last March, he landed two nearly identical bass that together topped 10 pounds, and after a few retrieval tips, I battled my own behemoth to hand. Although this particular lake is known for nice bass, I did not expect such a prodigious catch from hand-numbing water. When starting out in early spring, I used to focus on the shallow, sun-soaked cover that attracts baitfish, such as downed trees or remnant weeds from last fall. Boggio, though agreeing that cover and baitfish are definitely important, rarely works these shallow flats. Instead, he focuses on changes in the bottom contour. Finding these deeper edges near shore where the baitfish roam is the crucial component to his strategy. He looks for points that scallop the shoreline into a series of little bays, points that may be less pronounced above water but that include underwater edges and depth changes. Bass regularly stage along such shorelines in the main lake and also in the larger bays before migrating to shallower spawning flats. Lay downs along steeply sloping banks are also worth a cast or two, and some of Boggio’s best fish have come from what appeared to be featureless banks where the sonar had revealed a drop-off with a stump or rock pile, the classic spot on a spot. Since the baitfish are not necessarily on the break line, the bass may station at a range of depths, perhaps somewhat shallow inside a drop-off or suspended deeper out in open water. This is why Boggio likes to hold the boat out in the lake and cast into the shoreline rather than parallel to it along a particular contour. Depending on the location, he may fish shallower or deeper on either end of the cast, starting the lure at 5 to 7 feet and then running it through water as deep as 12 to 14 feet. In order to really probe a spot on a spot, Boggio may crawl a pig-and-jig, slow-roll a spinnerbait, jig a lipless crankbait, or slink a soft plastic. However, he mostly fishes suspended jerkbaits, what he calls “slash baits,” his favorite being the Rapala X-Rap Size 10 in Olive Green or Silver. When largemouths hold deeper, as is often the case when the ice lingers, he may opt for the X-Rap Deep. These neutrally-buoyant baits have a solid following among bass anglers, including myself. Boggio has refined the presentation in ways that maximize effectiveness in early spring. Calm water makes it easier to detect slight line movement, crucial to detecting pick-ups with a suspended lure. Boggio also looks for clear water. Muddy is definitely out, though a tinge of stain may be tolerated in an otherwise promising location. Northern reservoirs support limited algae and other murk-producing microorganisms during March and April, yet snowmelt and rain runoff may dirty the water, especially at inlet bays. When facing such conditions, Boggio heads for the deep lake quadrant that typically includes the dam and searches from there. However, if a tournament or other obligation does not necessitate fishing a stirred-up reservoir, Boggio may simply move on to a lake with cleaner water, perhaps a reservoir fed by a smaller stream like the one we fished last March. It is widely known that pauses during the retrieve can trigger strikes from following fish. Some suggest letting a suspending jerkbait hang motionless for 30 seconds to a couple of minutes in the chilly water of early spring. For the impatient, like me, 30 seconds can feel like 30 minutes and 2 minutes is definitely not happening. Boggio relieved my mind on this one. His preferred retrieve is slowly methodical, without the extended stops. This covers water quickly without sacrificing the lure’s sluggish, easy-to-eat look. He can readily maintain contact with the lure throughout the retrieve and also observe those line twitches. “You have got to keep an eye on your line,” Boggio emphasized. He likes Stren Clear Blue Fluorescent mono in 10- or 12-pound test because it is easy to see yet not so gaudy it might spook fish in clear water. It is very manageable in cold water, too, amenable to the lure action, diving depth and retrieval he prefers. Boggio calls his go-to technique “dragging,” an apt description. After a long cast, he sweeps the rod down and back, pulling the jerkbait down to quickly reach running depth. He pauses. Then, holding the rod at that downward angle, about the 10 o’clock position, he languidly winds in line while letting the rod tip creep back toward the lure, at about the 1 o’clock position. Then ever so slowly drags the rod back to 10 o’clock, lazily waggling the bait forward that short distance. He pauses again and repeats the cadence, doing this all the way to boatside. Except for that initial plunge, the lure is never forcefully jerked or pulled, only accelerated when a deeper retrieve is desired. Controlled contact with the lure is easily maintained and especially beneficial on wind-whipped shorelines where no bay offers refuge. On breezy days, such shorelines can be outstanding, though line and boat control both may be a bit problematic. When Boggio and I fished together, he caught both of his big bass dragging. It quickly became my favorite retrieve, too, after I hooked my lunker while emulating Boggio’s rod action. 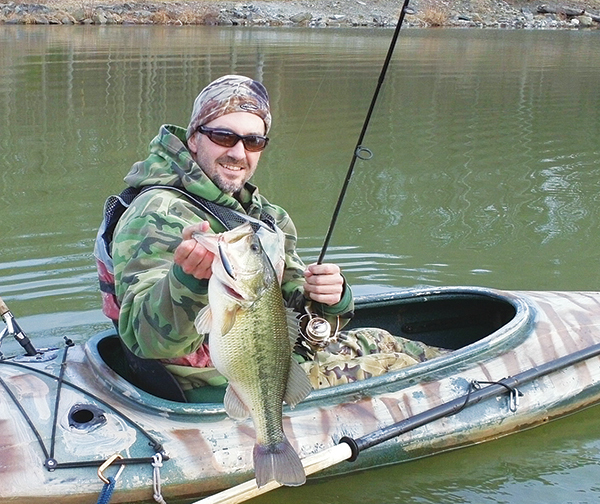 As effective as the drag may be, sometimes bass will ignore a bait that just pokes along. When Boggio isn’t getting any takers, he may add pops and starts to the retrieve, looking to provoke a reaction strike. The distance the lure travels during a pop is about the same as during a drag, only it moves much faster. A quick restart usually provokes the strike. An extremely wild cadence may get the nod when bass are herding baitfish up on the shoreline, a likelier scenario later in spring as water temperatures push towards the 50-degree mark. During summer, smaller bass do most of this chasing. That is not true in springtime, as the brutes often join the fray. While fishing later last spring, in April, I saw panicked gizzard shad thrashing on the surface near shore, a few literally leaping onto the bank. My brother cast into this melee and hooked a 6-pound largemouth while working a jerkbait very aggressively. Some pauses are needed, but the idea is to make sure the bait is seen, heard, and even felt by a nearby bass. It is often a good idea to experiment with lures or cadences until fish are boated. But in the brief span of a late afternoon in March, there may not be time to establish a pattern. Then, Boggio advises staying with that methodical dragging action. While Boggio insisted that early spring stands as the best time of year to catch the biggest bass in the lake, bites are rarely fast and furious. “These are not fifty-fish days,” he granted. Accepting this goes a long way toward maintaining a methodical technique that slowly but surely covers the water. Eventually, that persistence will pay. And when it pays off with a mega-bass, Boggio pleads for anglers to take a quick photo and then release the fish unharmed. These egg-laden females make up an extremely small percentage of a total bass population yet produce an excessive portion of the genetically-gifted offspring, the ones that carry those big-bass traits. Arguably, no other time on a northern reservoir ranks higher for lunker potential than shortly after ice-out, about the time the crocuses also open their cups to the warming spring sunshine.